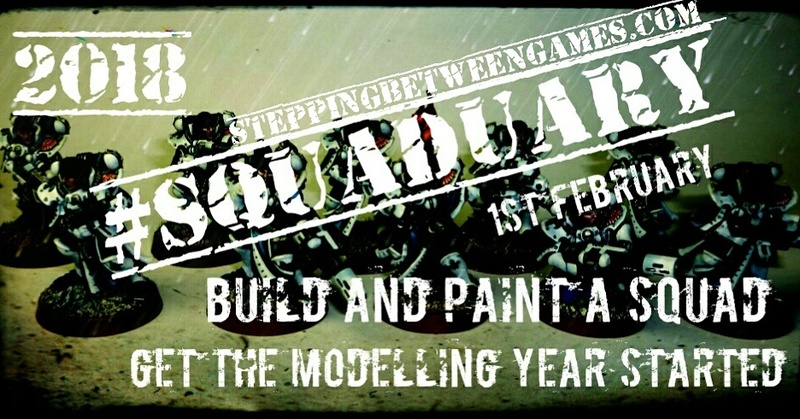 Stepping between Games - #Squaduary Feb 2018. Heresy Era Imperial Fists, Rapier Quad Bolter Battery......COMPLETE!! #Squaduary entry complete! Huzzah! And with plenty of time to spare. I'm pleased with them but I won't be using the "lazy" sepia wash technique again on my legion models as the finish is a little too dark, it's worth the extra effort and time to get a cleaner yellow tint to the mustard finish. A big shout out to Rory over at "stepping between games" for once again providing motivation to the community. As with all this army I've really enjoyed painting them and the next couple of months will see me painting more "Fists"; this time primarily for 40k, using the same scheme so I can use most of the models in either 30k or 40k as the need arises. These 40k Imperial Fists are for my entry into "Battlefield Birminghams" doubles tourney in June, stay tuned for a lot more on that in coming months. As ever C&C more than welcome and good luck with your own #Squaduary entries! Quick update on my squad of scions I am working on for stepping between games #squaduary. I have finally managed to finished my 5 man units of scions despite getting distracted by painting sly marbo at the same time. Bluddtoof here with another #Squaduary update; the Imperial Fists Quad Bolter Rapier Battery is coming along well. These photos are as of last night; I've got the metal done and the red detailing is complete, currently working on the rest of the detailing such as skulls, lenses, iconography and cables. Once that's done it's just transfers and final weathering to go, so I should be all good to finish by months end. Coming along well, however I wish I'd been more careful with removing the gates and other casting detritus as the bolters have suffered a bit and have some damage around the muzzles. I also tried a faster method of applying the seraphim wash in the recesses; it's worked ok and was significantly quicker but it has resulted in a slightly darker finish to the armour. Lessons learned! Bluddtoof here with an update on my #Squaduary 2018 project; Imperial Fists Heresy Era Rapier Quad Bolters. I am in reality a little further on as I've Nuln washed all the steel, just waiting for it to dry before taking photos. So I'm well on the way. That's the bulk of the time consuming stuff done, just the fun detailing left and then weathering etc. More to come next weekend, hope you're all enjoying #Squaduary as much as I am. 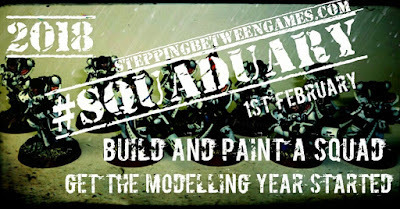 Bluddtoof here with a post introducing my entry into "Squaduary Feb 2018" this years event hosted by Rory at "Stepping Between Games". This is a great opportunity to get some motivation for painting up a unit, head over to his blog for more info and inspiration. It was a bit tricky getting the gunners right arm in the correct position so I played around with pinning and in the end I chopped off the lever that controls the gun carriage and replaced it with a jewellery wire pin into the hand. these are are all currently un glued so once it's all painted and I'm ready for assembly, I can adjust as needed. But I reckon they're pretty close as they are. Bluddtoof here with some more of my expanding Heresy Era Imperial Fists; this is quite possibly the most enjoyable army I've ever painted in my 30 years in the hobby. So much fun to do and I'm really pleased with the finish too, so win win for me! This project was to get all the character models I had painted up, these 4 models were part of my stag do present from the code boys and include Alexis Pollux and Sigismund and the Imperial Fists Command set; a Praetor and Standard Bearer. The models were all nice and easy to build, I didn't do much in the way of modification except to change the Praetors pistol out for a serpenta, mainly cos I like the look of it. The only issue I had was with Sigismund's sword which was very warped, lots of heating and shaping later and it's now almost straight but simply wouldn't flatten completely. Very pleased with these and the Legion is slowly growing. Next up will be a Rapier Weapon Battery of 3 Quad Bolters and crew which will form my entry into "Stepping between games" "Squadruary" event.